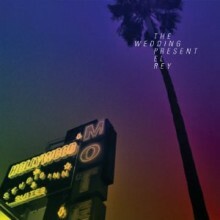 Three years after their “comeback” album, reformed indie pop/rock group The Wedding Present are back with their eighth studio release, El Rey. For this recording David Gedge and his crew of musicians decided to return to sound engineer Steve Albini, who recorded their critically acclaimed Seamonsters album in 1991. This direction proves to do the trick, as coupled with Gedge’s strong lyrical content and singing El Rey is arguably one of The Wedding Present’s strongest efforts yet since this group reformed in 2005. With Albini behind the boards, the riffs on this album really stand out. Though The Wedding Present’s music still fits in the indie pop/rock category, it should be mentioned that their riffs are noticeably darker than many of the other acts currently out there. This may not be surprising to long time fans, but is worth mentioning because even after all these years this band has not lost their edge. And although not every song on El Rey is a classic, even the weaker tracks still will leave a mark on listeners which is a sign of good song writing. As with many Steve Albini produced albums, the vocals are somewhat buried in the mix which is both good and bad. Sometimes this works well, giving the singing an ethereal quality. However, when the instrumentals die off and the vocals are still at a relatively low volume it makes the music feel a little empty, and David Gedge doesn’t always have the ability to fill up the empty spaces with his voice. But overall this isn’t a big issue, and the subtly humorous lyrics should please those who have stuck with The Wedding Present for years. El Rey isn’t exactly album of the year material for its genre, but it’s definitely a great release from a band that many listeners may have forgotten is still around. If Take Fountain was considered The Wedding Present’s comeback album, El Rey is a sign that this is a group who has truly been rejuvenated. And though I wouldn’t necessarily recommend that new listeners start with this release, established fans and those who remember this band from the past will want to give this one a shot.